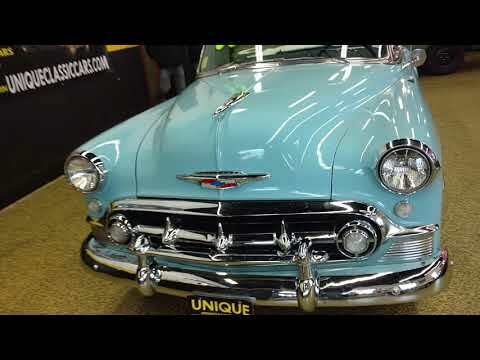 1953 Chevrolet Bel Air Convertible, 40 year ownership! Trades/offers? Here's a convertible that you don't see everyday, it's just been traded in and now available for sale. This car was babied by the same owner over the last 40 years! He had always wanted a high performance Vette so he decided to trade for one and part with his baby. He had recently rebuilt the 235 inline 6 cylinder which was known as one of the great Chevrolet engines due to its performance and durability. The 235 is still paired with a powerglide automatic transmission as it would have came back in 1953. It was also equipped with a power top option when it left general motors. The car has had a repaint some years ago as well as interior work. This is the type of car that can be driven and enjoyed, like the previous owner did, or put some T.L.C into it and take it to the next level. Take a look at the pics we have of exterior, interior, underside, trunk and engine compartment, please feel free to call us with any questions. You can also watch the video walk around of the car and hear it run. I think you'll see we have the car priced very fairly in the market of 53 Bel Air convertibles! We can be reached at 507-386-1726 and ask for Jeff, Jay, or Landon. You can also email "sales@uniquemankato.com" ALL TRADES AND OFFERS WILL BE CONSIDERED.....FINANCING IS AVAILABLE! !